What methodology can be used to develop Blue Corridors in practical marine spatial planning? How can a passive dispersal along a blue corridor be modelled and how can a spawning locality within one nation’s territorial waters influence populations within another nation’s territorial waters? Several international directives and conventions call for the establishment of networks of protected areas. Most definitions on networks of protected areas include the concepts of representatively and ecological coherence. Connectivity among protected areas is an essential part of ecological coherence. Blue corridors, i.e. the routes through which different areas are connected, are essential in the network of protected areas in the sea. The BALANCE project already reviewed and discussed the literature on blue corridors in detail. This practice builds on these findings by defining practical ways for using the concept in MSP. Provde examples and recommendations on how to work with the subject of Blue Corridors in practical marine spatial planning. The report follows this outline, and for each step in the scheme, discusses possible questions, data sources and analyses. Furthermore, a case study has been done with the aim to illustrate if it would be possible to identify specific targets for connectivity within a transnational network of marine protected areas. Conclusions have been developed for the several steps as presented in the methods used. MPA ́s and MPA networks should have clearly formulated goals for management. If the goals are not specific enough, identify key species or groups to analyse from the connectivity point of view. Or just any species for which good data are available. This step is essential in order to formulate concrete actions. Natural and human processes may contribute to limiting the dispersal. Preferably, the consequences for the connectivity in MPA networks of any human activity or construction should be assessed. It is possible to model connectivity between sites by linking oceanographic models with ecological or species-specific knowledge, and thus obtain information about how well individual sites within a network are connected. In most ways, the knowledge, methods and regulations used to identify actions to ensure connectivity are no different than what is already used in marine environmental planning. The difference is the additional emphasis not only on effects on the area where the threat occurs, but also on effects in other areas. A combination of tools is probably the most efficient solution. This means that there is a strong need for close cooperation between different groups of managers e.g. conservation managers and resource use managers. 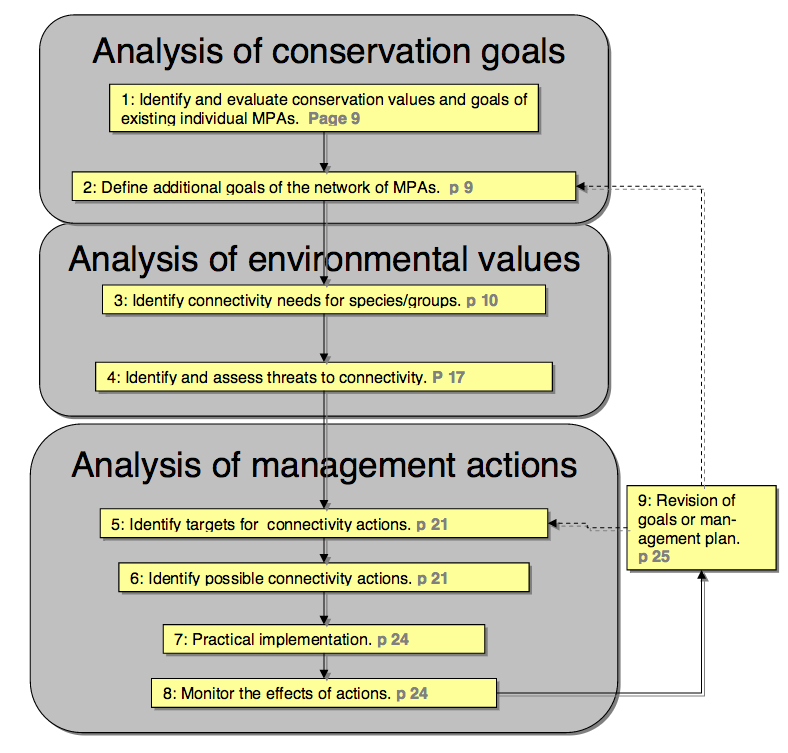 The process will probably not differ in any fundamental way if the planning is for an MPA “with connectivity” (as part of a network) or for an “independent” MPA. However, some parts of the implementation, e.g. stakeholder involvement and support, may be more difficult. There is a cost (financial, time, credibility) to change an existing management plan, but it is a waste of resources to have a management plan or a network of marine protected areas that does not achieve the aims of their existence. For such adaptive management, the rules of how, when, and by whom the plans may be revised should be formulated in the management plan. The focus of this practice is on the planning of marine protected areas (MPAs) in the Baltic Sea but some of the ideas presented here can also be useful for other planning processes, and in other areas.